tags: Cody Hoyt, David Foster Wallace, Infinite Jest, What happened in Infinite Jest? This is the latest entry in Words, Words, Words the ongoing liveblog of David Foster Wallace’s Infinite Jest. 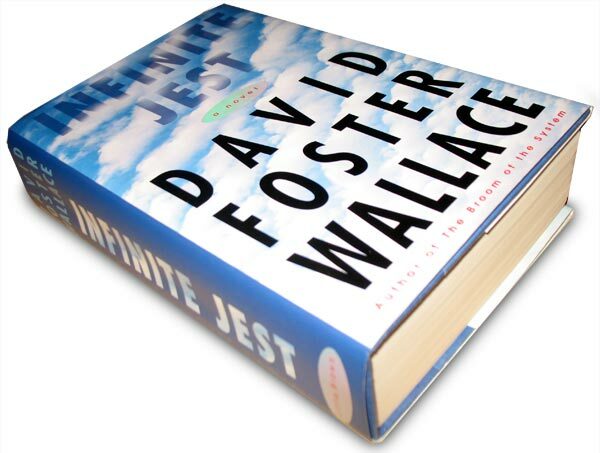 Had Wallace “completed” the story, he would have distracted from what I think is the real meaning of Infinite Jest. Stay tuned for Part 2, in which I’ll tell you what that is. Credit: “KN/PC: Infinite Jest” by Cody Hoyt. Buy it in print, canvas or shirt form here. So, I may have misspoke. The truth is that isolating a single “real meaning of Infinite Jest” is next to impossible. On one hand, it can be said that the novel is about many things: fathers and sons; mothers and sons; addiction; communication; entertainment; politics; greatness, mediocrity and failure. It’s a coming of age story alongside a recovery story that is also possibly a love story, all wrapped in a cloak-and-dagger-ish mystery about international realignment and terrorism. Choose your favorite combination and go with it. The book is about a lot of things. On the other hand, it’s tough to say the book is actually “about” anything at all. As we have noted, there is no clear resolution. We never see the characters learn lessons, come of age, fall in love or be at peace in any way that warrants a Happily Ever After type of closure. The book literally stops far away and chronologically ahead of the main events in the novel (sort of) and we don’t entirely know who lives or dies, or what the shape of the continental borders look like, or whether fathers connected with sons. I’m sure many of the most frustrated readers have tossed up their hands and decided that Infinite Jest is really about nothing at all, some kind of post-modern experiment in reader-annoyance-tolerance-levels where we’re supposed to be thinking about what it means to read stories when really all we wanted was to just plain old read a story. Rather than walking away from IJ in one of these two unsatisfying directions, it is possible to follow a third and potentially satisfying way. I believe there is a unified theory of Infinite Jest that explains the various particles and waves of the novel — or most of them, at least — and helps clarify why Wallace made some of the choices he made. Read more at Fiction Advocate. Hey, just wanted to thank you for this post and the whole liveblog in general. I finished IJ for the first time a few days ago and your blog raises some really interesting and great points. Vin, thanks for the kind words — and for reading. Really glad it was helpful. I’ve never gone looking for the “big mysteries” in IJ – I read it several times for the more superficial experience of some of its pieces. The train jumping story framed as a comedic academic plagiarism, for example. My copy, though, is most heavily worn throughout the Eschaton chapter, which is clearly visible as a dark band of pages when viewed resting table-top closed from edge-on. The Eschaton-instance as played by the kids results in an un-intended conflagration for the characters which ends the game-theoretical life of the game known as Eschaton. 1.) The destruction of the game begins with a single, theoretically unaccounted-for wild-card strike of a single projectile whose impacts, consequences, and implications are all out of scope for the rules, axioms, and apparatus. 2.) That “pre-axiomatic” tennis ball launched by Evan Ingersoll, representing the Muslim middle-east, was motivated by a combination of game-theoretical utility and a strong dose of fear and humiliation – motives equally attributable to the actual middle-east as well as to the AFR. and the AFR in possession of the copy-able master of the film, IJ. It is worth contributing to the internet-wraith-like-corpus of commentary upon the novel IJ that DFW begins the process of engulfing the fictional universe of IJ in the Continental Emergency by engulfing the Eschaton in an Emergency of its own. Like Hamlet’s play-wthin-play-within-play epistemological layering, the Eschaton is the war-within-war-within-war epistem which layers out to the Continental Emergency – a war resulting from the launch of a single unpredictable projectile, whose existence and consequences were all wholly unintended – the launch by the AFR (like Evan Ingersoll, hated, feared, and humiliated), of its own copies of the film IJ (like the 5 megaton tennis ball launched at Air Marshall Kittenplan). I’ve often thought that the Eschaton passage was the funniest, most cohesive, and best-written single narrative episode in the novel, but now I think I know why it’s also the most important for reducing the novel’s four great threads into a single eschatological conclusion. Stice and Hal’s final at the WhatABurger, with Stice possessed by the wraith JOI, will be the last event in the IJ universe. The entire novel was dictated by wraiths from beyond the grave after the nuclear holocaust Hal sees the first contrail of overhead.